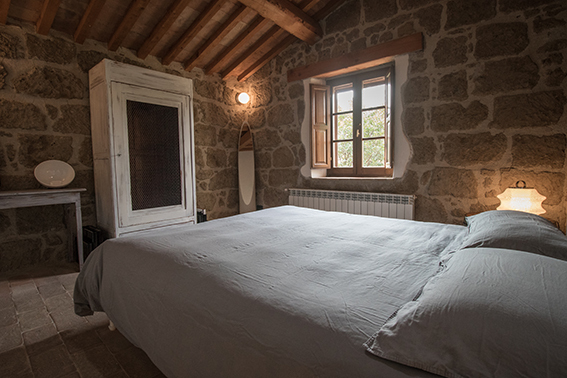 Orto room is a double room on the first floor with a gorgeous view of the organic orchard. Facing east, restored according to the criteria of organic construction. Furnished with natural wood furniture and art objects from creative recycling. 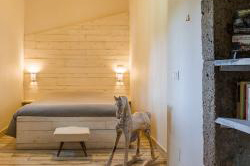 The cork walls allow a generous thermal insulation. Full elegant shower in a spacious and comfortable bathroom. The only room of the house that can be 100% darkened. 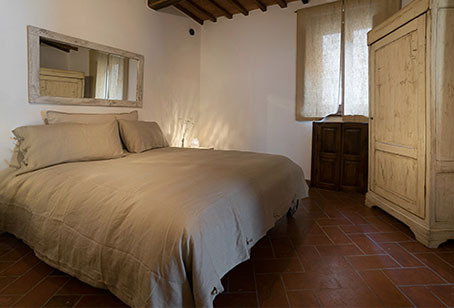 Riciclo Suit is a double room on the ground floor with direct access to the garden, furnished with a table and chairs under a magnificent mulberry. On request is possible to add a 3rd bed. The room, facing west, has been inspired by the creative recycling of old items and agricultural tools used by peasants of the last century. Inside this room is an old oven where in the 1600, the whole community of the area used it to cook bread, now used like romantic fire place. 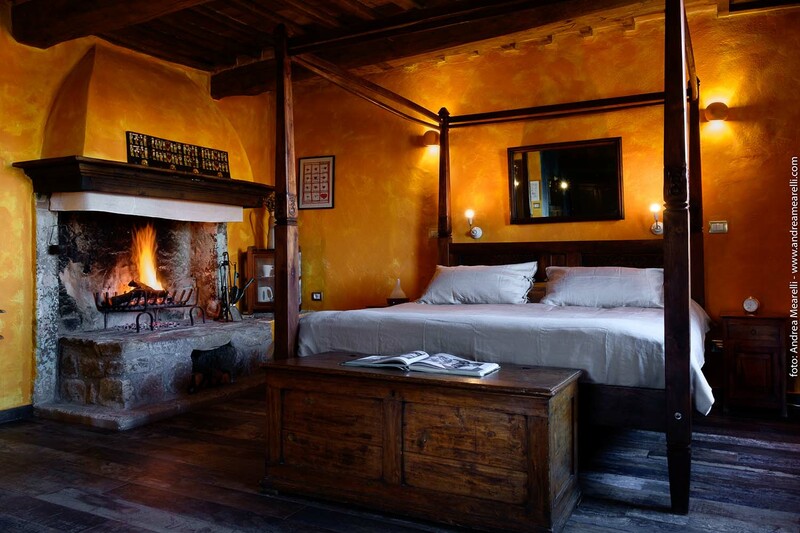 A double bedroom, romantic dining table, sofa, fire place, bathroom and many books. Not darkened room and does not have a bidet. Rustica Suite is a double suite Located on the ground floor, with private patio furnished with a comfortable chair overlooking the organic pool, garden and direct access to the hot tub. 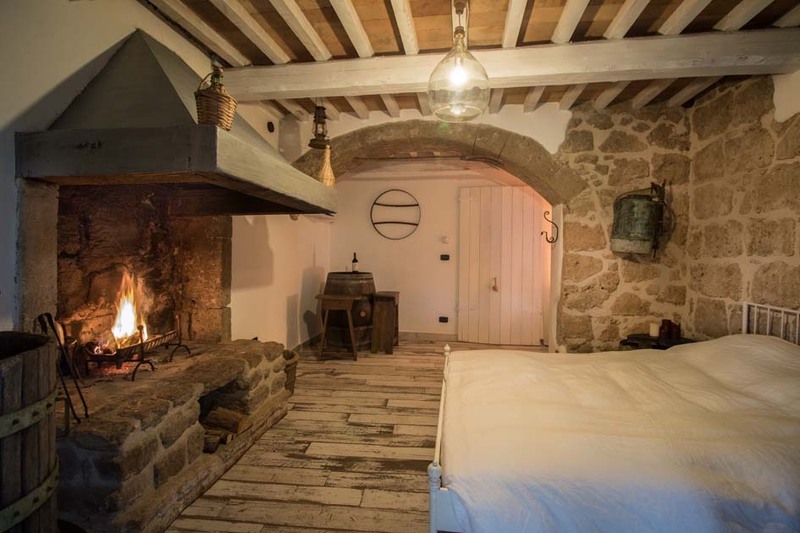 It has a romantic fireplace and the furnishings are the result of a private collection of objects that were used to make the harvest in times past. The bathroom has a large shower floor. This room is accessible to people with disabilities. The room faces south and is not completely darkened. Classica room is a suit room with open shower and bathtub with garden and bio pool view. 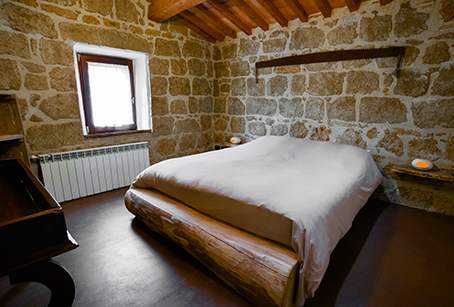 Is on the first floor furnished with natural wood. The theme of the room is the an old work of a woodcutter. The furnishings are the result of ancient tools of the trade. The room is facing southwest with views of the organic pool and garden, and has a double bed with a skylight above mode that allows you to see the stars. The room is not completely darkened. Minimal is a suite room with romantic fire place. It's on the first floor is bright, south-facing and is minimally furnished with objects from the '70s. A skylight over the bed lets you see the stars. Because of this, the room is cannot be completely darkened. The floor is of handmade terracotta. It overlooks the swimming pool and the organic vineyard. Do you love nature sounds, falling stars, countryside scents? 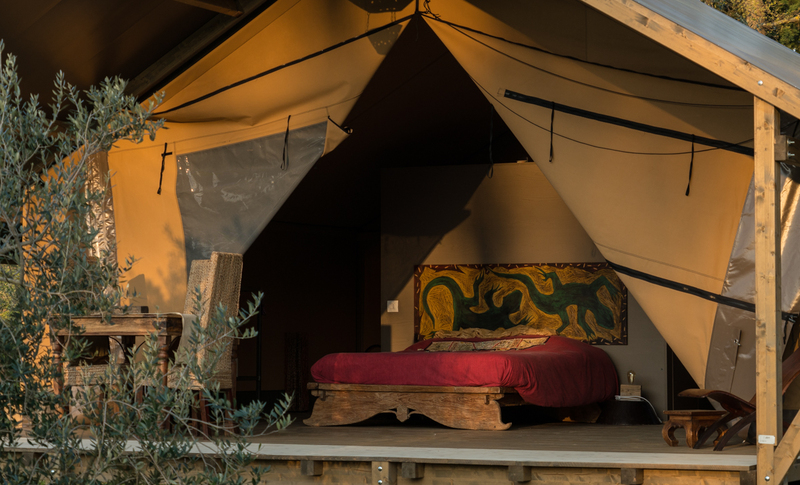 Glamping, a new sustainable tourism holiday, is arrived at the Sant'Egle organic farm! Sleep in a luxury tent with hotel suite comforts. Private bathroom, 50sqm of bio building, natural wood furniture, living room, private terrace, private garden, hot tub, BBQ and small details you will love. NEW restructuring in bio-building. 50 square meters of harmony and respect for the environment without sacrificing the comfort, the beauty and the pleasure of being pampered by details.